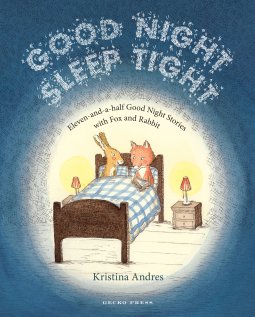 The full title of this picture book is Goodnight Sleep Tight, Eleven-And-A Half Good Night Stories with Fox and Rabbit. Fox and Rabbit live together in a little house beyond the molehills. In the first story, Fox accidentally locks Rabbit out, and Rabbit ends up falling asleep curled up on the porch, as Fox eats his way through three bowls of pasta and all the sauce in the house, then goes out to find more food. While he's out, Rabbit climbs in through the chimney and goes to sleep in Rabbit's bed which is still warm. When they finally get back together, they don't recognize each other and decide it is because they are covered with night dust, because they went to sleep so late. But they stay pitch black until their visiting friend, Elephant, takes them for a swim in the lake. Trust me. Elephant is the smart one. While this book is not exactly Wind in the Willows, it has its charms. The biggest attraction of Goodnight Sleep Tight is Kristina Andres' collection of illustrations, which have a belovedly familiar quality. We would definitely recommend getting the hardback so your bedtime babies will get the full benefit of the picture book experience. Books for kids have a tall order. They should have a subtle (practically invisible) moral lesson that is delivered in a package that is fun, entertaining, not condescending. They should use language well, introduce the reader to new concepts, places, stories and characters, as well as make all those things relevant. And the instant the story begins to smell moral, young readers are out the door. Those old mystery books series like Nancy Drew or the Hardy Boys managed to fulfill all of the above, as well as write to a child's eye view, and introduce essentials like the importance of side-kicks. Robert J. Harris's Artie Conan Doyle and the Gravediggers' Club also does a pretty good job of filling this very tall order. It seems a no brainer to pick young Artie Conan Doyle to be the inquisitive main character of a child mystery, but it is a perfectly genius concept. And of course, Artie must have a childhood sidekick to parallel Watson, hence the dependable and oft hungry Ham. Even the 'Gravedigger' title falls perfectly into the kid mystery genre, too. And where better to begin the tale than in the beautifully drawn murk of Greyfriars graveyard a week after the death of the most famous of loyal terriers, Grayfriar's Bobby? Mix together ghosts, gravediggers, a mysterious tenant, the lady in gray, a couple of curious boys, and fantastic ambiance and you have a solid recipe to satisfy any reader's mystery appetite. Artie and Ham felt quite real to me as we were hot on the trail of the mystery. I even like well-read Artie's home library, and hope young readers will be inspired to check out Artie's favorite books. 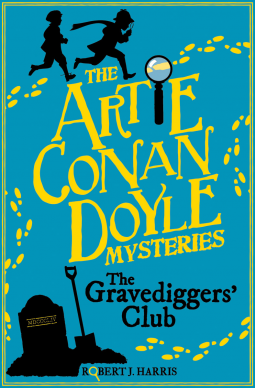 I recommend Artie Conan Doyle and the Gravediggers' Club to any kid (or adult) who would be interested in Nancy Drew, the Hardy Boys, and even Sherlock Holmes. Meanwhile, I did a little research, and find myself intrigued by some of Robert J. Harris's other titles. The Hardy Boys* meet Arthur Conan Doyle in Robert J. Harris's Artie Conan Doyle and the Gravediggers' Club. Twelve year old Eliot Dionisi gets sent off for summer vacation to visit his mother’s family in Nova Scotia. His parents think it will be a big adventure for him, but Eliot is not so sure he wants to see his Grandmother McNeil. He stays with his Uncle Earl who is a fisherman, and makes friends with some local kids from Point Aconi whose world revolves around fish and the boats that go out to get them. 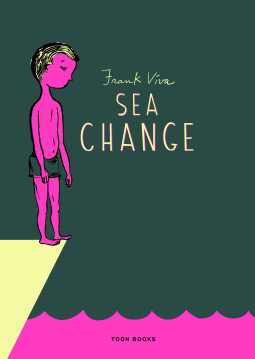 Sea Change by Frank Viva is presented in a creative fashion, with child-like drawings that bring a youthful perspective to the table. Contrary to his expectations, Eliot discovers on his vacation the place that his Mother had "spent an entire summer in Point Aconi, and it was the best summer of my life." Eliot's summer vacation speaks of all summer vacations spent encountering strange friends, and encountering new foods and strange ways that only take a few months to feel like home. What is appealing about this book is the nostalgia and romance of summers-gone-by. However, there is also a looming threat from a coal manufacturer that never comes to a point. Maybe Frank Viva is planning more stories where the coal giant is taken on. If that whole thread had been left out, it would have been a better book. I am sure I was not the only one who spent the whole book waiting for that other shoe to drop. It never did. A child, the ninth daughter of the ninth daughter is brought up in the prophesy of being the one who would heal the riff between their two great nations on the small Island that is cut off from the rest of the world by a mist. The Riff is great enough that one says these nations are not brought together, will foretell and cause the end off all. This is a great deal to put on the shoulders of a young girl who from birth has been unable to show even the skills of the most simple spells. As if her magic was totally mute. But is it? As things move along and the time comes for her to pass magic test to advance in her learning, things are not all what they seem. Fantasy has been growing to include ingenious people and their language to give more authentic texture to the stories an the root of all magic which is in the people, the land, and the sacred names by the people who have long live in its mist. The only reason I have given it less than ten, is some more editing is needed to correct some typos and sentence structures. The only reason I am giving this a five is for two basic problems. My Kindle view for the iPad was badly formatted and very difficult to read, with foot notes being mixed in with the story instead of, well a footnote. Also the story looked like it was in mid-editing, with the edited items left rather than removed or changed. I loved the gadget making sections and plan to try the hot dog maker since we are not allowed in our compound to do honest fire based BBQ, this could be an environmental run around. 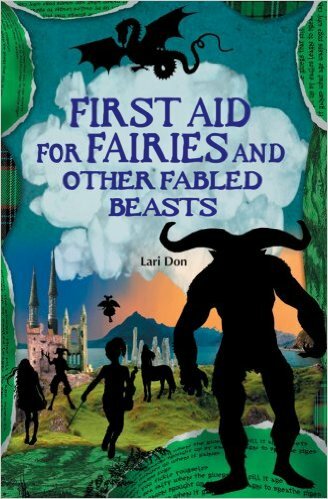 Now this was the FIRST book I read in the six volumed series. Normally it is perfectly all right, if it was written to be able to continue a series and as a stand alone. Hey, I read it with Nancy Drew books, and I worked my way back and forth over the series. In this case, it not working for me. You almost have to read all the other books in order. A well-written book can handle the stories being read out of joint. In fact. they would inspire in you the desire to find the rest of the story without feeling like you have no clue as to who these kids really are. The story had some good strong points though. I loved the science gadget make it help (already said) and I like the quirky personalities the characters had. 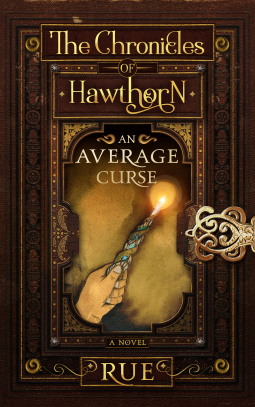 My major problem is the pacing and how the book feels really less than half finished, almost as if they needed a fat outline to get the book approved, but never got around to actually writing the whole thing.